For a city rich in history, Madrid houses several different shops that will peak the interest of anyone, regardless of budget and age range. If you are looking for new clothing to update your wardrobe or simply a small birthday gift for a loved one, you will be able to find it in Madrid. The balance between vintage treasures and modern items that you can purchase makes for one of the most versatile shopping experiences in the world. Salamanca District – Located in one of Madrid’s most upscale neighborhoods, you will find a wide variety of shops, restaurants, and fashion bars. Calle Serrano – A long avenue that crosses through the central part of the city North to South, it is a great place to shop while being centrally located. 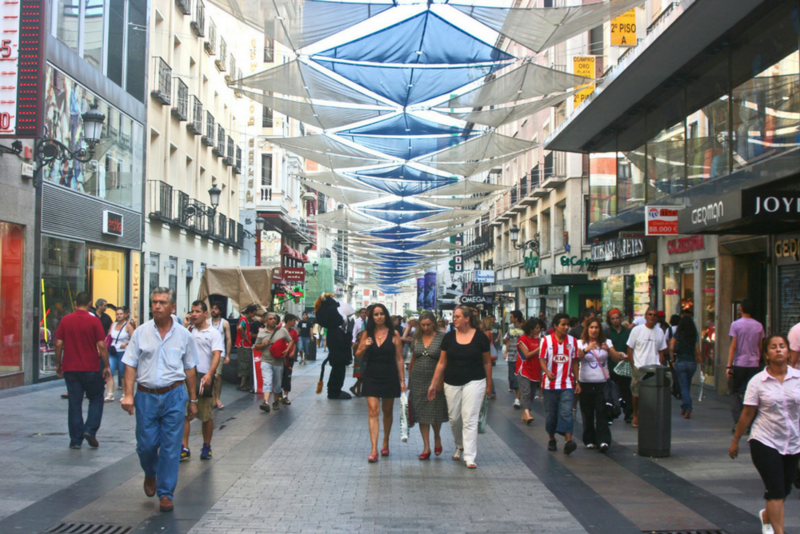 Calle Goya – Great shopping at lower prices, there is a small mall at the beginning of the street and several eateries. Gran Via – This strip is often compared to Times Square due to the variety of shopping that you will find, great to walk down for a day of shopping. Chueca – The gay and fashion district nearby Gran Via. Lots of opportunity to shop for casual clothing or to enjoy a meal. El Rastro – If you are interested in browsing through a marketplace, this one is a popular one to visit. You will be able to find many goods and articles of clothing, some secondhand. Whether you have a frugal budget or no budget at all, it is still recommended that you visit the above shopping areas in Madrid. It is a beautiful city that is full of life, and it is guaranteed that you will find something that you like. Most of the fun in shopping in an unfamiliar place comes from the exploration.